For those who don’t know, J. K. Rowling's tale of the young wizard Harry Potter was born in Edinburgh. It was at The Elephant House café that the author sat when she began writing her famous books about Harry Potter. The café is still there to this day and has the slogan "Birthplace of Harry Potter" in the window. If you are in Edinburgh, you shouldn’t miss the opportunity to visit The Elephant House and get a bite to eat and drink, or at least just peek in to see the place where J. K. Rowling created most of her great works. You’ll find one of the quieter and more peaceful parts of Edinburgh along the Union Canal. The Union Canal is an historic canal that was built in the early 1800s and extends between Falkirk and Edinburgh. The reason that the channel was allowed to be built was so that minerals, especially coal, could be transported to the capital. When the railway arrived in the mid-1800s, it reduced the channel's importance and eventually goods traffic ceased. On a visit to Union, you’ll find several pleasant walks along the canal and bike paths that lead all the way to Falkirk. If you choose to bike all the way to Falkirk, it’s a great opportunity to see the Scottish countryside and its beautiful surroundings. You can also take various boat trips and enjoy a cup of afternoon tea on deck while you enjoy some relaxing sightseeing on the water. If you want to get an overall picture of Scotland, you should really be sure to visit the Museum of Scotland. In total there are 2000 years of its history, from the first fossils to today's popular culture. Here you’ll find various design objects, historical stories, art, science, and more from Scottish history. Regardless of age, there is much to see and do and there are also several activities for the youngest of children. Expect to spend between two hours and half a day to give you time to take advantage of everything the museum has to offer. Admission is free. Edinburgh is a very beautiful coastal city and there are several nice places to visit which are situated along the Scottish coast. One of these places is Portobello Beach, a beautiful beach located only eight kilometres from Edinburgh city centre. The beautiful beach environment, combined with walking paths, make Portobello Beach a great place to visit when you want to relax and get away from the more vibrant areas of the city. When the weather’s a little warmer, you can swim or just cool your feet in the shallow water at the beach. In autumn and winter, it may be better to come a little later in the day to see the beautiful sunset and perhaps even dine at any of the restaurants in the area. Portobello is actually not just a beach but an entire suburb of Edinburgh, and there is therefore a lot more to see than just the beach. Bus number 26 from Edinburgh departs regularly to Portobello. Another place to go to for some relaxation from the intense streets of the big city is The Royal Botanic Garden. This botanical garden is like Edinburgh's own little oasis full of plants and flowers (a total of over 13,000 different plant species), a cosy little promenade and beautiful ponds and streams. Whether you are interested in different species of plants and botany or just want a change of scenery, the Royal Botanic Garden is a very nice place to visit, particularly during the warmer parts of the year. Like most European cities, Edinburgh has an older part of town that’s been preserved and where the architecture has not changed to any great extent for several centuries. The Old Town of Edinburgh is extremely beautiful and among previous visitors and tourists, this is one of the attractions that ranks very highly. The old city is perfect both for visitors interested in architecture and for those who only want to walk around in a nice atmosphere. It includes plenty of nice shops, restaurants, pubs and small alleys to explore. 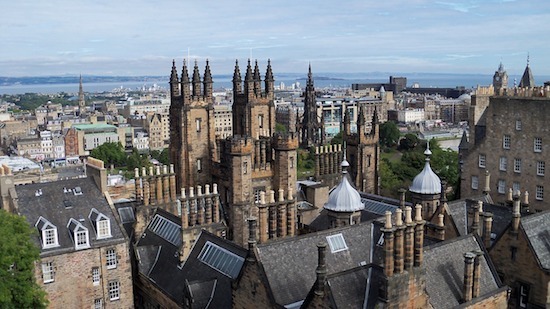 It is also in the old city that one will find some of the city's main museums and the stunning Edinburgh Castle. Arthur's Seat is the highest peak of a mountain which is actually an extinct volcano, which lies just to the east of Edinburgh's city centre in the Royal Holyrood Park. Up from Arthur's Seat, you get a fantastic view across Edinburgh and the Scottish landscape which stretches around the city. You can look out over Scotland in all directions—for example, gaze eastwards and you can look out over the sea. To get to the top of the mountain you have to hike up, but with the amazing 360-degree view ahead, it is well worth it. If it is warm and dry in the grass, climbing the mountain in everyday "tourist clothes" is not a problem. However, if it’s rainy, it may be a good idea to wear a pair of sturdier shoes. The Royal Yacht Britannia, or HMY Britannia, is a large former Royal Ship that belonged to Queen Elizabeth II between the years of 1954 and 1997. The Royal Yacht Britannia was widely used by the royal family during these years and among other things was used by Princess Diana and Prince Charles for their honeymoon. In total, the Royal Yacht Britannia has taken the royal family to over 600 ports and 135 countries. Today, the ship is moored in Edinburgh's port and is now a museum that anyone is allowed to visit. As visitors to the ship, you'll get the chance to see everything from how the crew lived to what it's like to stay in the royal family's luxurious "Royal Deck Tea Room." To board the boat costs about £15 for adults and about £8 for children. In order to see and discover everything on the Royal Yacht Britannia without rushing, you should expect to be on the ship for a few hours.